“ATP Rapid Hygiene Monitoring” is employed for testing clinical staffs hand washing, cleaning / sterilization processes and surfaces to ensure that adequate infection control is being maintained. These tests are extremely important in preventing cross-contamination and ensuring your processes pass compliance. 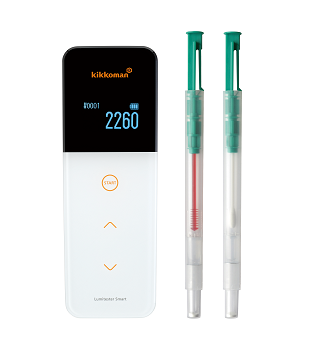 Kikkoman’s Rapid Hygiene Monitoring Systems use the ATP+ADP+AMP swab test method. The test area is wiped using the reagent kit LuciPac A3 which combine a reagent and self-contained swab device, after which light is emitted as a result of chemical reaction between luciferase-luciferin-PK-PPDK reagent and ATP+ADP+AMP. The level of luminescence is measured using the Lumitester measuring instrument, and the degree of cleanliness is determined based on the amount of ATP+ADP+AMP detected. 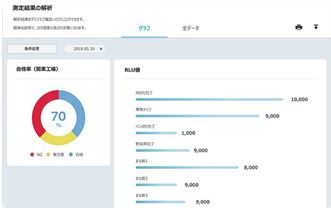 The degree of contamination is immediately shown as a numerical output, enabling a process of “check and take action” that is not possible using traditional culture methods, and thus allow accidents to be prevented before they occur. The Lumitester measures the level of luminescence based on a biochemical reaction between ATP and Luciferase. The “luminescent analysis” used here enables measurement at a higher level of sensitivity than most analysis methods, and for this reason, a “luminometer” is required to pick up very feint light emissions. Conventional luminometers, however, are large, heavy, and expensive, and thus are generally not suited to environmental hygiene monitoring applications. 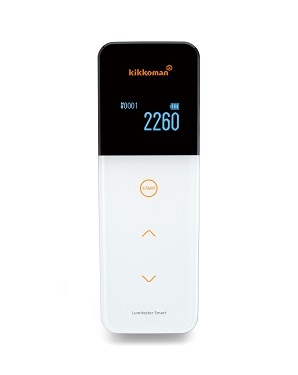 Kikkoman has successfully broken through this barrier with the Lumitester Smart – small, lightweight, low-cost luminometer. 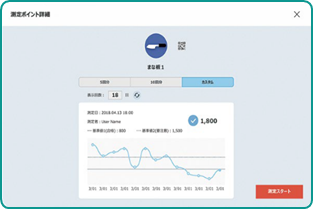 Recorded data can be displayed in time-series by registering with our specialized App. Inspection pass rates are automatically graphed and improvements can be visualized. Employees will be more conscious of hygiene, and will maintain a high standard of environmental sanitation, which will help build greater trust in your business. Data will be stored in the cloud and can be accessed from anywhere in the world. This will allow fast detection and response to any problems that may arise. 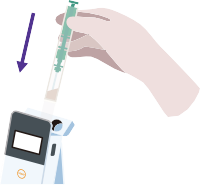 The Lumitester SMART was specially designed for rapid hygiene monitoring applications, with particular attention to low cost and ease of operation. 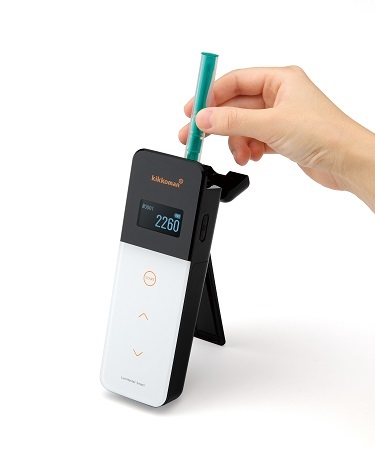 The compact unit can be carried in one hand; and connects to a specialized APP to obtain readings and record keeping. 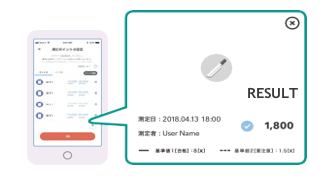 By using the Lumitester SMART in combination with specialized reagent, LuciPac A3, anyone can conduct ATP+ADP+AMP swab tests anywhere, anytime. 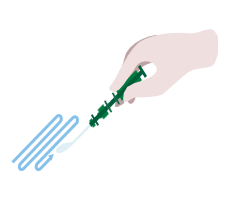 LuciPac A3 are kits that combine reagents with the swabs required for ATP+ADP+AMP swab tests for picking up ATP+ADP+AMP　from the test area．Take the swab from the kit and wipe the object to be tested, and then returns the swab to the LuciPacA3 unit. The operation is completed with the push-in the swab and mix with the reagent. The Lumitester provides an immediate numerical indication of the target object’s degree of cleanliness. The Kikkoman ATP+ADP+AMP hygiene monitoring test kit LuciPac A3 Surface is a kit for testing cleanliness levels using bioluminescence techniques with firefly luciferase developed with Kikkoman’s unique biotechnology. This kit can be used to test cleanliness levels using a swab test. Do not use this device for any purpose other than what it was designed for as a tester of cleanliness levels. Please be aware that this kit cannot be used to test or measure for viable bacteria counts levels or more specific types of pathogenic bacteria. This kit is used to indicate cleanliness levels in healthcare treatment facilities. This kit shall not provide any guarantee that a given test environment is free of bacterial contamination.